Rochester City Hall is located at 30 Church Street, Rochester NY 14614; phone: 585-428-5990. Photo: George Eastman House, ca. 1905, 900 East Avenue, Rochester, NY. 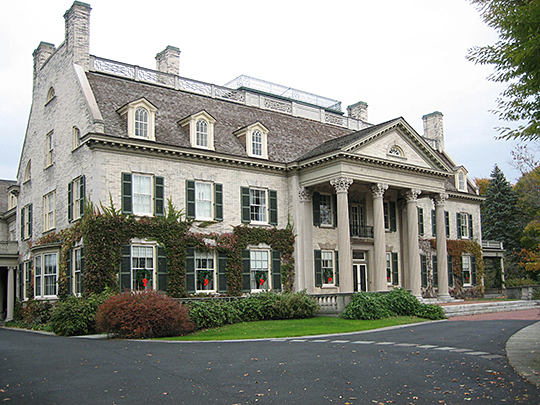 Owned by the University of Rochester, it serves since 1947 as the George Eastman House International Museum of Photography and Film. This National Historic Landmark was listed on the National Register of Historic Places in 1966. Photographed by User:Dmadeo (own work), 2007, [cc-by-3.0 (creativecommons.org/licenses/by/3.0)], via Wikimedia Commons, accessed January, 2013. Embracing some 36 square miles of territory, with a population (1930) of 328,152, Rochester ranks third in size among the cities of New York State. Its geographical center lies 8 miles south of Lake Ontario, at the Four Corners, the junction of Main with State and Exchange Streets, where the village of Rochesterville began to grow in the early years of the 19th century. For a hundred years the Four Corners, just west of the Genesee River, was the heart of the city's commercial life; and the old Third Ward, farther west, the "ruffled-shirt district" which grew up around the home of Col. Nathaniel Rochester, set the tone in social life. But in recent years the city has rapidly moved eastward. Today most of the leading stores, the theatrical district, and many of the larger hotels are found on the east side of the river; and East Avenue has supplanted the Third Ward in social prestige. But the Four Corners still marks the financial center of the city; and its stately old buildings, though they may grate on modern architectural tastes, retain an air of solid dignity that is lacking in the newer district across the river, where old buildings unceremoniously jostle the new and where the streets are marred by the gaps of parking lots. Like most other American cities, Rochester has grown, not according to a plan, but rather in response to the unregulated expression of individual enterprise; hence the helter-skelter street plan, particularly the irregular crosshatching of short streets in the downtown business section. Rochester is a city of homes; in 1937, 43 percent of its families owned their homes; in pre-depression days the percentage was much larger. Main Street may be typically "Main Street," but East Avenue, shaded by over-arching elms, its pretentious homes on spreading lawns almost hidden by foliage, has been called one of the most beautiful residential streets in America. The city has other streets of a distinct individuality: Oxford, with its magnolia parkway; Clifford Avenue with its blocks of flower-filled yards; Ambassador Drive, with its new and stately homes; Livingston Park in the old "ruffled-shirt district," with its century-old mansions and air of quiet distinction. The parks of Rochester, long admired and emulated in other cities, also have their individual charms. Highland Park has its lilacs, its azaleas, and rhododendrons, and hundreds of varieties of conifer trees; the grassy slopes of Genesee Valley Park border the waters of the winding river; Seneca Park occupies the verge of the Genesee Gorge; and Durand-Eastman Park is noteworthy for its beach, its hilly terrain, and its rose bowl. The beginnings of Rochester go back to the settlement of eight villages the sites of which are now included within the city limits. Rochesterville itself, from which the main line of descent derives, stood upon part of the land known in history as the Mill Yard Tract. After the Revolutionary War, both New York and Massachusetts laid claim to a large part of what is now western New York State. By compromise in 1787, sovereignty over the land was awarded to New York and ownership to Massachusetts. In 1788 Massachusetts sold some 6,000,000 acres of land to Oliver Phelps and Nathaniel Gorham, on condition that they obtain title from the Indians. The Indians ceded them 2,600,000 acres east of the Genesee and added 200,000 acres west of the river for a mill yard on condition that a mill be erected on this land for their use. Phelps and Gorham conveyed a 100-acre tract on the west river bank at the falls of the Genesee to Ebenezer "Indian" Allen on which he was to build and operate a grist mill. The place was known as The Falls. When Allen moved into his mill in 1789 he became the first white settler on the site of Rochesterville. So sparsely settled was the section in that year that when the mill was completed, only 14 men attended the raising bee and drank the canoe-load of rum provided for the occasion. Within the next decade a number of settlements were made in the vicinity: John Lusk at Indian Landing (1789); Enos Stone and others from Lenox, Massachusetts, in what is now Brighton (1789); William Hincher at the mouth of the Genesee, now Charlotte (1792); and a group of four New England families, supplemented later by the seven Hanford brothers, at Hanford's Landing (known until 1809 as King's Landing), the site of which is east of Lake Avenue and north of Ridge Road. Allen's hundred acres were not a favorable location for settlement. According to early accounts, it was a dreary swamp infested with snakes and mosquitoes, and threatening settlers with a malarial type of fever called "Genesee fever." In 1792 Allen sold his property and moved to Mount Morris. After changing hands several times the 100-acre tract was purchased in 1803 by Col. Nathaniel Rochester, Col. William Fitzhugh, and Major Charles Carroll, three gentlemen from Maryland. Fitzhugh and Carroll settled in Livingston County; Colonel Rochester gave his name to the present city. Settlement was slow. In 1809 when the State Legislature authorized the supervisors of Ontario and Genesee counties to build a bridge across the Genesee River at the site of the present Main Street bridge at a cost of $12,000, the opposition protested that no one had any reason to cross the river at that point. In 1811 Colonel Rochester and his partners surveyed their land and offered lots for sale. On July 4, 1812, Hamlet Scrantom moved with his family into a house built for him on the site of the Powers Building and became the first permanent settler on the 100-acre tract. In the same year the bridge across the Genesee was opened to traffic and drew more families westward.